verdict: her descriptions make even escargot sound delicious. and it cinched my decision to take french next year. aside from following the written accounts of monsieur and madame child’s adventures in gastronomy and gallic living, i have been checking things off my mental to-do list. this list yesterday included bill paying, investigating the text editability of a .png file and then reporting on the results, and one other thing i have in the meantime completely forgotten. this evening it included sending an e-mail about bridesmaid’s dress alterations, and then the lovely task of filling out legal inquiry forms for writing a will. i didn’t know life and death required so much paperwork. and all so that some superfluous veins can be removed. oh well. when i was at the young and romantic age of twenty-and-a-half, i wrote a poem about how i’d like my funeral arrangements to be carried out. read the joyous dirge for yourself here. 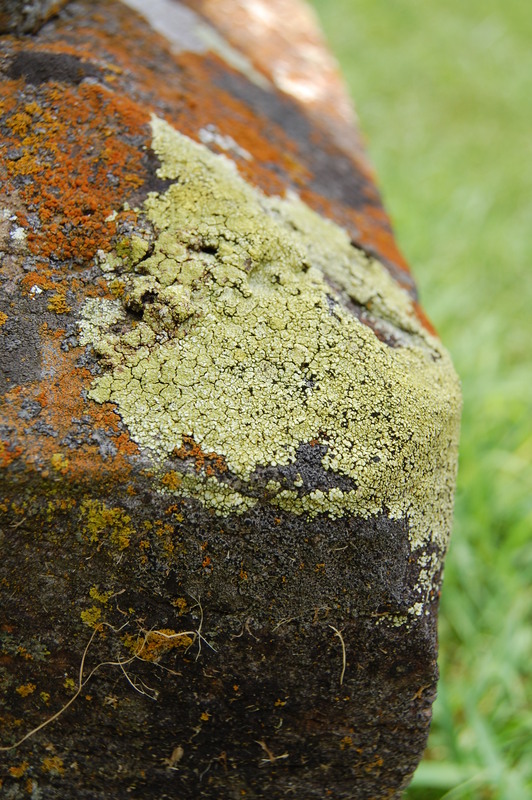 how long would it take to grow all these lovely lichens on my tombstone? at the slightly less young and less romantic age of nearly 23, i still am fond of this poem. but my present state of mind, expressed during a fourth of july graveyard visit, runs more along the lines of “for heaven’s sake, don’t give me a tacky gravestone.” i happen to loathe a healthy percentage of modern funerary monuments. this reminds me of the total oddness of modern death in general. mom used to work at a jewish hospital here in kansas city, and she said jewish people, when they die, must be buried in a plain pinewood casket without preservatives and such nonsense. so they have to be buried within a couple of days or so. yes! please, please bury me like that, world that goes on existing whenever my body has died. costco sells caskets (who knew? copy editors know! ), and i was looking at them online this evening just out of curiosity. they’re the normal overwrought, pluffy-lined type things one normally sees people buried in. honestly, i don’t care two cents about the embroidery, metal trim or wood stain on my coffin now, and i doubt i’ll care about it if i die when i’m 83. just bury me in a plain pine box, and i’ll be happy as a clam. because, my goodness, my soul will have much more important things to do after my body’s dead than worry about how it was buried. but please don’t burn me up and stow me in a little gaudy jar, either. i know it saves space, but that’s just weird. okay, sorry. that turned out a little more macabre than i meant it to. i promise i am not that depressed, or depressed-sounding. :) actually, the idea of having brain surgery is still a bit humorous. and filling out paperwork always makes me a bit grumpy. 2 replies to what will you? Still praying that all goes well. God is on the throne, and you can have confidence that He has your BEST in mind.